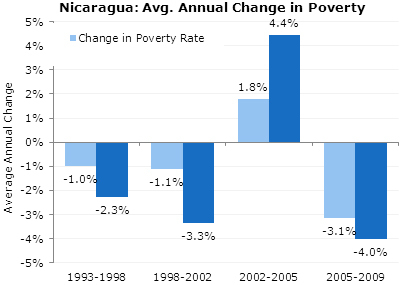 Given that the world economic downturn occurred right as Ortega’s government social and economic programs were taking effect, it is surprising that poverty decreased at the rate that it did during this period. 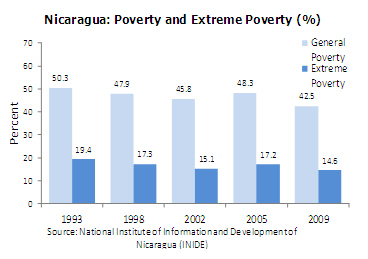 The latest household survey, published in 2009 by the Nicaraguan National Institute of Information and Development (INIDE), showed that while poverty decreased by only 9 percent between 1993 and 2002 (an average annual improvement of 1% per year), this rate of improvement tripled after 2005, decreasing by 12 percent in the four-year period between 2005 and 2009 (an average annual improvement of about 3% per year). There was an even more pronounced change in the levels of extreme poverty, which had declined at a slow pace between 1993 and 2002 and had risen alarmingly between 2002 and 2005. In the four years after 2005, extreme poverty witnessed an average annual decline of 4.0 percent, compared with a 4.4 average annual rate increase between 2002 and 2005. Complimenting this reduction in poverty and inequality, health statistics from the World Health Organization, World Bank and the Nicaraguan Central Bank demonstrate a continuing improvement in overall quality and access to health care. While the rate of GDP growth actually diminished between 2006 and 2009, turning negative in 2009 during the world economic crisis and recession, government spending on health care increased during that period, as will be discussed below. 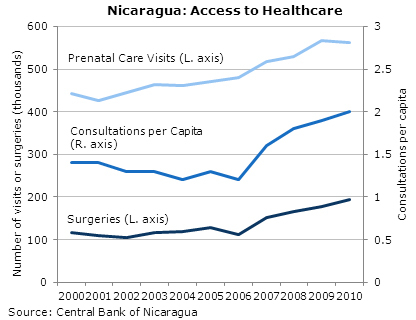 As a result, an increasing number of Nicaraguans have had more access to doctors and medical treatment (Figure below). Also in the last five years, there was significant progress in reducing infant and child mortality rates, despite the economic crisis and recession. This progress was greater than in other, similarly situated lower-middle-income countries. 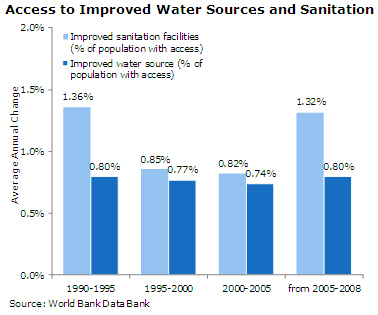 Access to improved sanitation facilities increased at a faster pace between 2005 and 2008 (the last year for which data are available) than in prior years, despite the fact that Nicaragua’s economy did not grow as fast as in the previous years. These kinds of improvements required substantial investments in infrastructure. Government spending on healthcare as a percent of GDP increased by more than 18 percent between 2006 and 2009, while it had only increased by 12 percent between 2000 and 2005, an even longer time period. In addition to poverty reduction and improved health care, access to schooling and quality of education has also continued to expand. Government spending on education as a percent of GDP markedly increased from 2005 to 2009, again despite the fact that real GDP grew at a slower pace during this period (Figure below). Net enrollment in primary school has also continued to rise, albeit it experienced a small decrease in 2010 with the drop off in government spending on education. 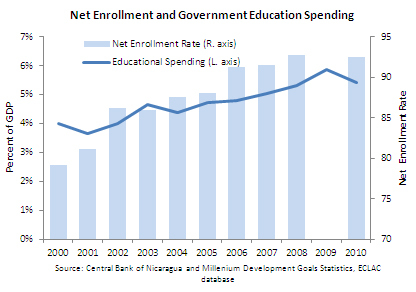 Overall, since 2006 Nicaragua has experienced a significant decrease in poverty, coupled with increases both in access to health care and education. These economic and social improvements were achieved despite the world economic crisis that slowed growth in 2008 and pushed Nicaragua into recession in 2009. These gains probably played a significant role in the electoral success of Daniel Ortega and his political party. 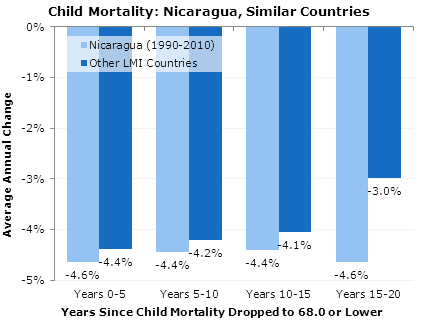 Average mortality ratios of all countries designated as Lower Middle Income countries by the World Bank, whose mortality rates have been at or below Nicaragua’s 1990 levels (infant mortality of 51.6 and child mortality of 68.0). 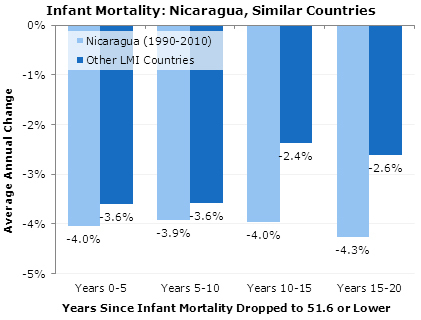 These rates are compared over a 20-year period: 1990-2010 for Nicaragua, and the 20 years after reaching an infant mortality of 51.6 or a child mortality of 68.0.